Gunma（群馬）prefecture is in the Kanto（関東）region, between Nagano（長野）and Tochigi（栃木）. It has many good hot springs, of which the most famous is Kusatsu Onsen（草津温泉）. Kusatsu Onsen has the largest flow of hot spring water in Japan, quality is also known to be good. Not surprising that it often comes in top in rankings. Went there during my Golden Week Kanto trip in 2014. Used the 3 Day Kanto Area Pass that cost 8300 yen. From Tokyo, took Shinkansen to Katsuta（勝田）, then transferred to local train to Naganohara Kusatsuguchi（長野原草津口）, followed by bus to Kusatsu Onsen Bus Terminal. Highway bus would be more direct, but didn't want to risk traffic jams as it was GW! It was a rainy day and temperature was only 9 degrees there despite being May. From the bus terminal, trekked 10 minutes up the slope to Yubatake（湯畑）, the symbol of Kusatsu, also 1 of the town's main sources of hot spring water. 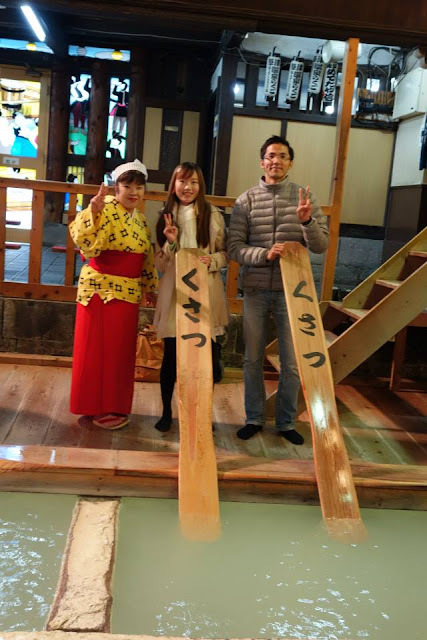 Besides checking out the shops nearby, we also went into Netsunoyu Bath House, where visitors can try Yumomi, a traditional way of cooling down hot spring water by using long wooden paddles. There are also Yumomi performances at certain timings. During these performances, visitors can volunteer to try Yumomi as well. There are public bath houses and foot baths which we didn't try. Checked in early into our hotel-- Kusatsu Now Resort Hotel, that provides shuttle service from the bus terminal. As I booked early, it costed only 9000 yen per night per pax, inclusive of 2 meals. Despite being buffet style, food was VERY good. 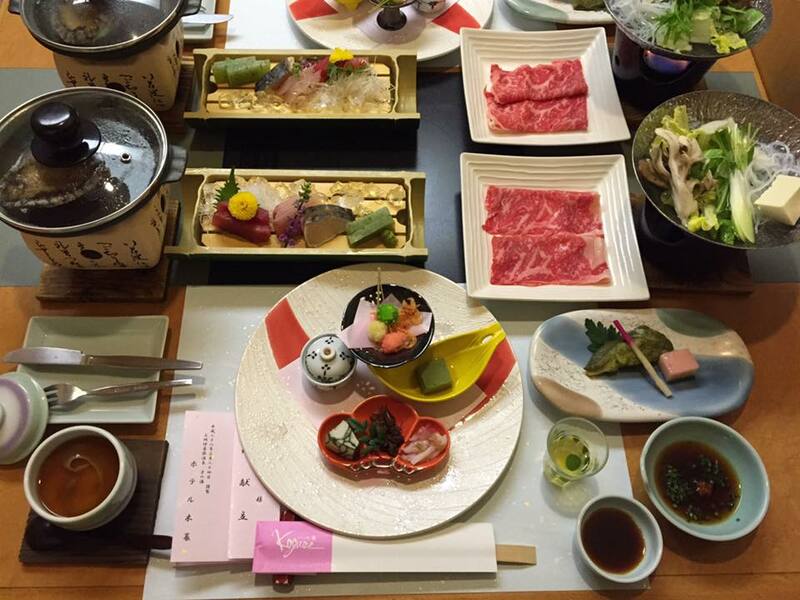 Wide assortment, with beef steak and pork ribs grilled on the spot! Onsen was great too! The next day, visited Mount Shirane's（白根山）Yugama crater lake, via bus from the bus terminal. It was nice trekking up to the lake (distance wasn't too long) while enjoying the fresh air and snowscapes. And the lake is baby blue! Kusatsu and Karuizawa（軽井沢）are linked by bus, it is quite a good idea to visit these 2 places together. In Spring 2016, I went to Gunma prefecture again for Ikaho Onsen（伊香保温泉）, using the JR Tokyo Wide Pass. It is also one of the famous hot springs in this prefecture, known for its reddish-brown waters. 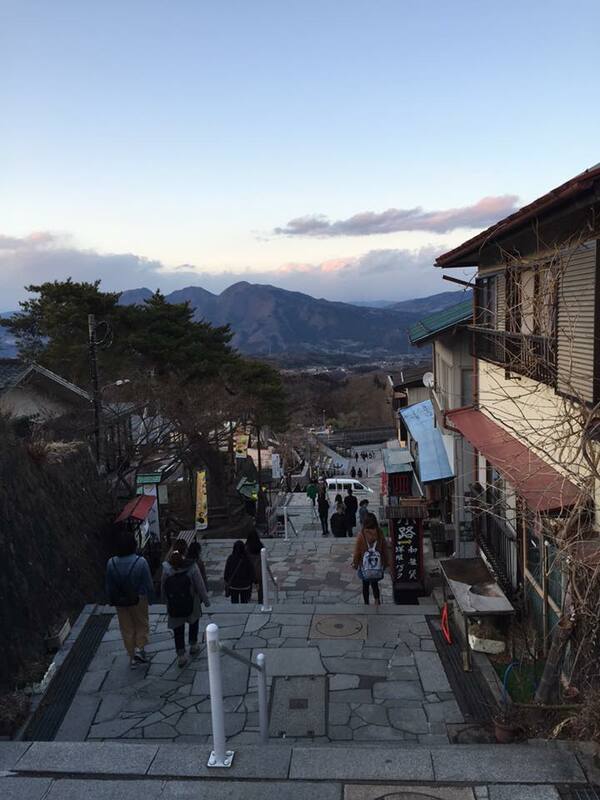 The old town has shops and ryokan lining both sides of a 300 meter long stone stairs. Common local products that can be found include manjuu (traditional Japanese confection), udon and pickles. 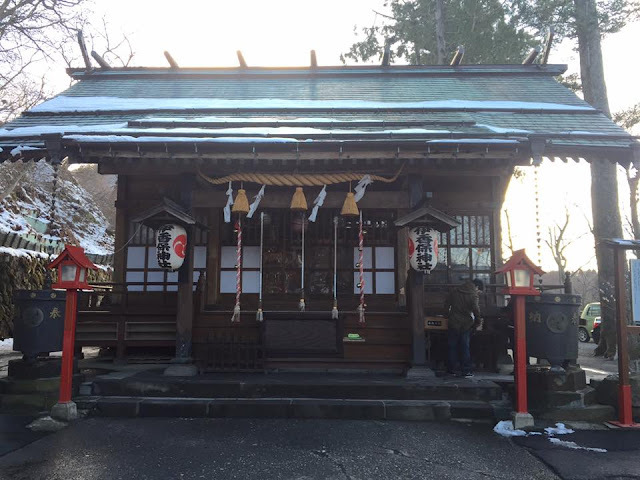 There is also Ikaho Shrine at the top of the stairs. It takes around 2 hours to cover the whole area in a comfortable pace.